over the weekend, i found myself at recreational outdoor exchange to register for a few road races: the VSO kabahagi fun run slated for this sunday at mckinley hill (that should be challenging) and the nature valley run 2010 which isn't until the end of may. the nature valley run will see whether i would achieve my goal of doing a 2-hour half marathon, and whether my renewed vigor for the sport will result in anything tangible (by the way, the run does not have a race course yet). while at R.O.X. (and a while later, runnr), i realized just how massive the road race organizing business is. obviously, a lot of people are cashing in on the craze. how this turned into a cool social event is interesting. i joined my first road race in 2003. there were few participants then, many of them regular runners interested in getting affordable but quality singlets. now, the races are nearly 3 times more expensive, and give out cheap singlets no one would want to keep. but anyway, what really amused me while i thought about which ones to register for (since on some weekends, there was a minimum of 3 events) was that all these races were branded as being larger than they actually are. some races go the for-the-benefit-of route, and i suppose it works on many because this somehow justifies the exorbitant fees. other races offer a variety of services, like running photos, a race analysis, a post-run fair, etc. one race offered participants the unique opportunity of becoming one of its models. and then there are those that rely on adjectives. 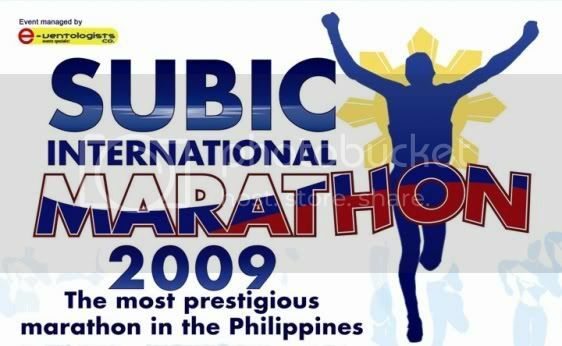 last year, the subic marathon touted itself as the most prestigious marathon in the philippines. 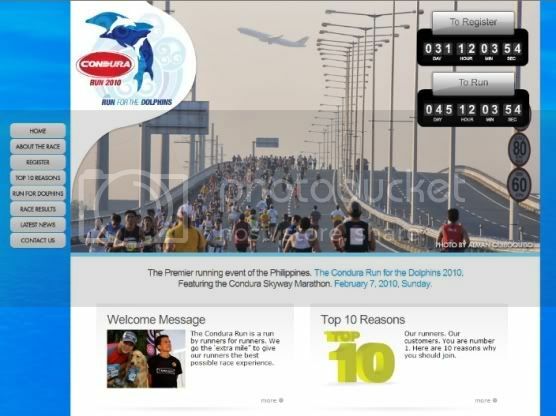 early this year, the condura run for the dolphins, only on its third year, dubbed itself the premier running event of the philippines. in september of this year, camarines sur will play host to the country's biggest international marathon in the #1 tourist destination in the philippines. so this has me really confused. which is the top marathon/running event in the country? by whose standards are these road races calling themselves the best? does having at least one kenyan participating in a race already make it international? are any of our races even in the radar of the world's top marathon runners? is the world even aware that this tiny dot between the pacific ocean and the south china sea is probably asia's most running-crazy country based on the number of races organized on any given weekend? is one successful staging of the event sufficient for a series to describe itself to be heads and shoulders above all other events? which is the longest-running road race/marathon in the philippines? by what measure do we say an event is well-organized? are runners even able to distinguish between truth and marketing? is there an agency that validates claims of greatness? are organizers resorting to glittering generalizations? has anyone of authority conferred any of these titles to these events? it's sickening, really, to be exposed to arrogant assertions of being the primary road race, but it's understandable: when race after similar race is staged every month, an event must distinguish itself from all the rest by resorting to gimmickry. but then again, i'm not asking for self-effacing humility. certainly, no event would want to brand itself as the "not the best running event in the country" or "not the first run to be held in bonifacio global city nor the only one organized this sunday" but are these marketing ploys even necessary? in truth, i can run a 10k on my own if i were so inclined. i will admit that running alongside a crowd is greatly encouraging, and having an official time is a good evaluation of your performance (in contrast to an unsupported claim that i finished x km in x mins, or if i post my time online even when my pedometer is not calibrated). but i run out of a more personal desire to be fit and healthy, and not because i collect action pictures no that hope to be seen by my friends and so i can brag about my time. i have goals which are very personal. but it's not like that with everyone.